When I hear the words "body butter," I think of a thick cream that melts when heated by the skin. Body butters come in many shapes and forms, such as regular and whipped. Naked Organix makes a version with argan oil, which I found had an unexpected but effective texture. 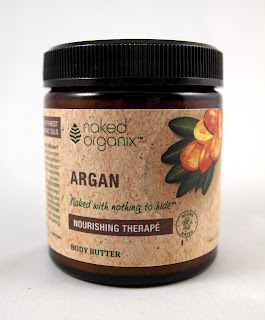 Naked Organix Argan Oil Body Butter is an effective, multi-purpose moisturizer. I enjoy using it on my hands, elbows, and knees. I found that it was more of a balm than a butter, and I'd love to see an even smoother texture and perhaps one made without beeswax. However, I do appreciate the purity of the ingredients and the relatively affordable price ($15). Disclosure notice: This product was sent to me free of charge by the manufacturer for review. No additional compensation was accepted and the opinions are my own. Please verify any claims with the manufacturer, especially if you have any allergies or concerns.